Black truffle comes mainly from Périgord, a region renowned worldwide for its gastronomy! The region's many culinary specialties include foie gras or goose liver pate (not everyone's taste), which is often prepared with black truffle. The Périgord black truffle or tuber melanosporum grows underground among the roots of oak, hazel or chestnut of Périgord where it feeds on decaying plants. That said, this unique fungus is quite temperamental, and only grows where it pleases! The small plot of land where it ‘elects domicile’, the truffière, is therefore protected as a real treasure by its owner. We’re talking about Black Diamond here! Folks from Périgord have been harvesting truffles since ever, and eat them in a very economical way. They indeed place some fresh eggs in a basket together with a black truffle, then forget about them for several hours, ideally overnight. The next day, the aroma of the truffle has spread to the eggs through their thin shells. Time to break the eggs and make an omelette on which they grate a little more truffle. The aroma and taste are just perfect, not too strong, not too weak. In fact, according to the Périgourdins, this is the only way to truly appreciate a black truffle! How to choose a good black truffle? 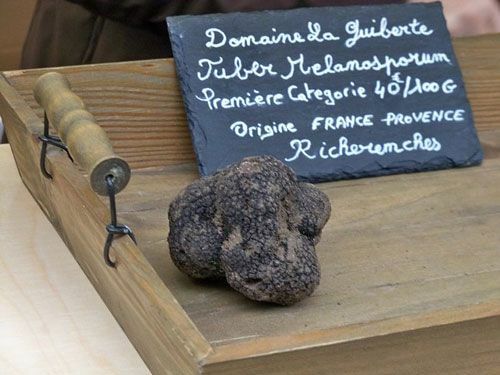 Périgord black truffle matures in 9 long months, one of the reasons why it is expensive to buy. It slowly forms in the spring, then gently matures over the summer and is ready for harvest in the autumn. The full harvest season runs from November to the end of February. A perfect black truffle should be about 7cm in diameter and weigh 100g. 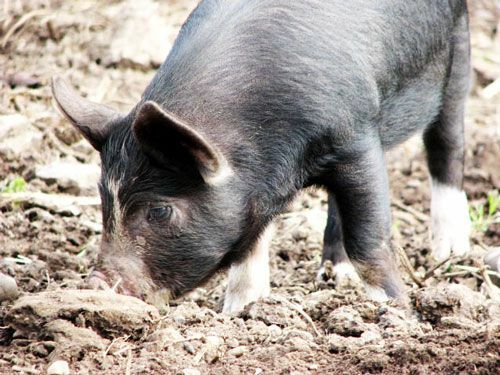 Périgourdins once used pigs to dig up the precious black truffle. As you know, pigs are very talented and smart animals; they indeed enjoy foraging in the ground and don’t mind getting dirty! However, Périgourdins have today replaced their pigs by dogs, another breed that thoroughly enjoys digging and getting muddy! Once harvested, the black truffle is thoroughly dusted before going on sale. Truffles grow in many countries. However, what makes the Périgord black truffle unique is its terroir, in the manner of a wine. This terroir gives it its beautiful black colour, its unique, powerful, earthy and woody aromas with touches of musk, and its incomparable flavour. Italy and China, among others, produce large quantities of truffles, but white truffles. These are a different species of truffles; they don’t have the same qualities as the black ones, but of course they are much more affordable. It's all a matter of taste and price! 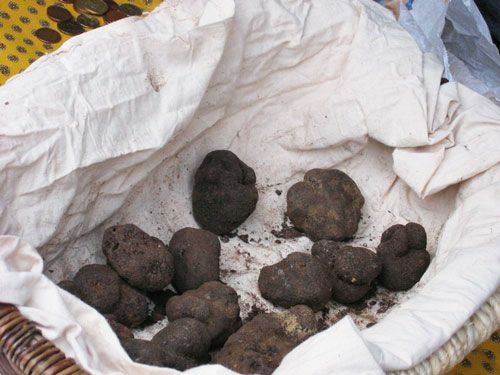 There are many black truffle markets in Périgord, and a visit to one of them is a real treat.